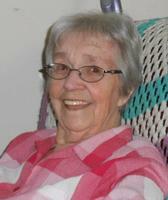 Provide comfort for the family of Margaret Hurtubise with a meaningful gesture of sympathy. Beloved wife of Aldebert Hurtubise of Hanmer predeceased. Loving mother of Daniel (wife Marguerite) of Manitoba, Moira Thibault (husband Gaston) of Sault Ste. Marie, Claudia Conron (husband Stanley) of Niagara Falls and Shaun (Jill Desimone) of Niagara Falls. Cherished grandmother of 10 grandchildren,10 great grandchildren and 1 great great grandchild. Dear daughter of Daniel and Catherine Johnstone (nee McClory) both of Scotland predeceased. Dear sister of Jessie Fleming of Scotland, Catherine Grieve (husband George) of Scotland, Bella Smith of Scotland predeceased and John (wife Min) of England all predeceased. She will be sadly missed by many nieces, nephews and extended family. Margaret was born in Scotland and met her husband during WWII. She was a war bride. Thursday from 2-4 & 7-9pm and after 10:30 am on Friday. Cremation at the Park Lawn Crematorium with burial alongside her husband in the Valley East Cemetery at a later date. Donations to the Kidney Foundation would be appreciated by the family. To send flowers in memory of Margaret Fraser Hurtubise (Johnstone), please visit our Heartfelt Sympathies Store. Consider providing a gift of comfort for the family of Margaret Hurtubise by sending flowers. Our deepest and heartfelt sympathy on the loss of your mother. We will always remember her warm smile. Our thoughts are with your family.